have listed the 2 ways that could probably help you to in data recovery of a failed Mac internal hard disk drive. You can fix Macintosh Hard Drive using a non-GUI mode on the Mac OS X. Follow the procedure below, to do the hard drive repair successfully. This will take you to the Single User Mode from where you can repair the Mac internal hard drive and access the files from it. When the FSCK command repairs the damaged volume, it displays the message stating “File System Was Modified”. Keep on repeating the FSCK command run until the files system gets corrected and you get the message mentioned in step vi. This method is simple yet very effective for hard drive data recovery. Target Disk Mode is one of the powerful methods to mount and access a failed hard drive by using some accessories, such as a Thunderbolt or a Firewire cable to connect the two Macs (Healthy and unhealthy Mac) for transferring file. Check the steps below to know how to connect the 2 Macs using the cable and do the hard drive recovery. Make sure that both the Macs are getting uninterrupted power supply. Connect both the Macs using a Firewire 400 or Firewire 800. You can also use a Thunderbolt cable for this. Start the Mac with failed or failing hard drive and press the ‘T’ button in the keyboard immediately. Boot your Mac in the Firewire mode. Once it’s done, a large Firewire icon will be displayed in your Mac screen. A healthy Mac will show the troubled hard drive icon on the Desktop. In the Mac HD you will see a Firewire symbol mounted on its icon. In case of thunderbolt cable, you will be able to see the Thunderbolt icon mounted on the Macintosh HD. Once Mac Hard Drive is mounted, you can do disk repair and copy files from hard disk to the healthy hard drive or external hard drive. Mounting, copying and accessing files from an unhealthy HDD to a healthy HDD is very easily to do with Target Disk Mode method. However, if the HDD is not able to mount on the healthy Mac then it will be almost impossible to copy or recover data from it. Fortunately, you can avoid the above steps and simply contact Datadoctor. Datadoctor specializes in Mac Data Recoveries and offers a reliable hard drive data recovery service for Mac users. They can help you to recover deleted files and data from all type of Mac operating system including, System 1-7, Mac OS X, Mac OS 8-9 and Mac OS X Server. Other than hard disk repair, they also offer other recovery services like USB recovery, flash disk recovery etc. Remember – Never run any software recovery tools on a failing or already failed hard drive. 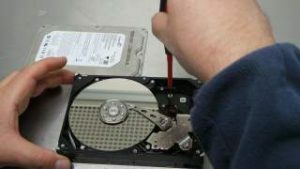 You increase the chance of a successful hard disk recovery if you get your drive to professional data recovery services.